Lost in the North-West Highlands, the remote area surrounding Loch Monar is for the most part hidden well from view. This vast wilderness holds mountains with long ridges and wide plateaus. We're here for 3 days of guided hiking to reach high Munro summits including Sgurr a'Chaorachain, Moruisg and remote Lurg Mhor. There's the option of some trail-biking. Keep your eyes pealed, we've seen eagles here ! Three days spent hiking over high mountains in the north-west of Scotland. 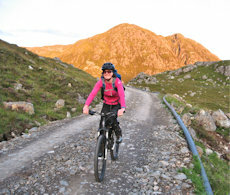 Cycle on fine tracks to remote locations, encircled by mountains and far away from civilisation. At a leisurely pace, explore ridges to reach superb vantage points from where stunning views can be appreciated. 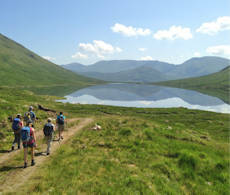 Bag up to 5 Munros in the area, including the mighty mountains of Lurg Mhor and Sgurr a'Chaorainn above wild corries and lochans. 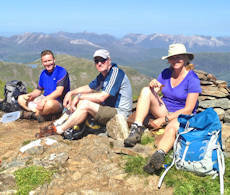 Join a small group guided by an experienced leader with extensive knowledge of the remote area. 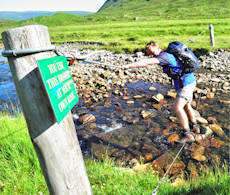 An event over 3 days of guided hiking to high summits in the area east of Glen Carron and around Loch Monar in the Western Highlands with one of our experienced and qualified leaders. Your guide will know the remote area well and be able to give you insight into the flora, fauna and geology. Bidean a'Choire Sheasgaich is craggy on its northern side and Lurg Mhor has an interesting notched gap leading to its eastern top. Views from most of the peaks are good, with fine vistas northwards to the Coulin Forest and Torridon peaks. We start our first day from the shores of Loch Carron with a long but pleasant cycle eastwards. Ending up near Loch Calavie, we'll then hike up the Matterhorn-shaped peak of Bidean a'Choire Sheasgaich. Lurg Mhor is then a stone's throw away, where we can enjoy a bit of rock-scrambling to reach its eastern top. We'll then return to our bikes and thrill at the sections of fast downhill free-wheeling back to the roadside. The peaks of Sgurr Choinnich, Sgurr a'Chaorachain and Bidean an Eoin Deirg tower above the lonely glens below. Long fine ridges, which are narrow in places, connect the mountains together,. From the road-side at Craig, we'll bike for 5km to a quiet spot near some waterfalls. Then on foot, we'll head south and follow some fine paths onto the ridges. We'll bag the Munros Sgurr Choinnich and Sgurr a'Chaorainn then head over to Bidean an Eoin Toll for those wanting some easy scrambling. Back to Sgurr Choinnich, we have a gentle descent on grassy terrain to return us to our bikes for a free-wheel back to Craig. Depending on group desire and weather, we may be able add in one of the nearby Corbett peaks of Sgurr na Feartaig or Beinn Tharsuinn. A hike up grass covered slopes at a relaxed pace to fine viewpoints. Our final day on the Monar mountains sees us enjoying a hike up grassy slopes at a relaxed pace to reach the summit of Moruisg. Starting from a couple of miles to the east of yesterday's meetup point, we'll head under a railway bridge then strike uphill through a recently planted woodland. It's steeper higher up, never too steep and before long we'll be up on the summit crest of Moruisg. Three cairns rest up here, we'll touch all three to ensure we've bagged the summit ! Munro-baggers can make a return by the way we came, but we prefer to continue over Sgurr nan Ceannaichean - a fine Corbett peak, recently demoted from the Munro list ! The routes have good approach tracks with faint paths on grassy slopes and some narrow ridges higher up. With the cycling, we have classed the first two days as 'demanding', Monday is classed as 'moderate'. A bike will also be needed, though should you prefer to walk, we can meet you ealier and arrange meetup points. Bike hire can be arranged nearby if required. Our days begin from the A890 near the villages of Lochcarron and Achnasheen which are around 50 miles west of Inverness. There is a train service from Inverness to near the start points.